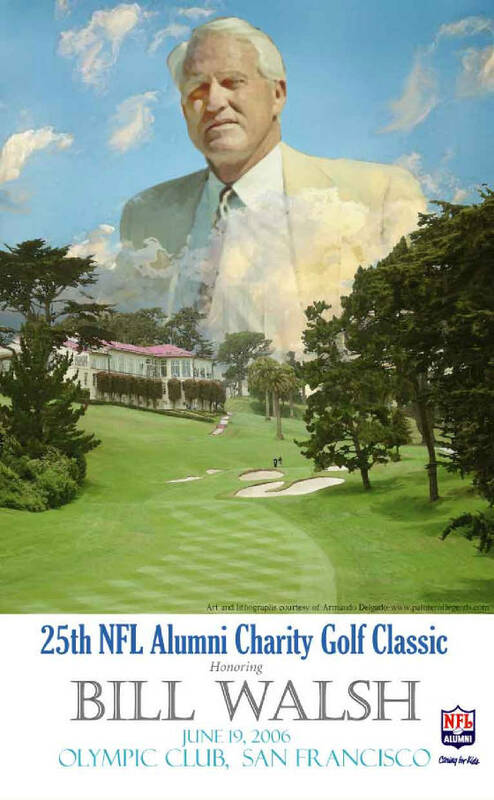 The NFL ALUMNI of Northern California commissioned Delgado to create this original painting honoring Football's HALL OF FAMER, Bill Walsh, San Francisco 49er Coach of 3 Super Bowl championships. 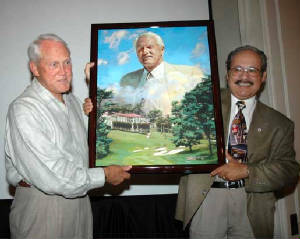 This painting was presented as a gift of appreciation for his accomplishments and for hosting the 2006 NFL Tournament. This event was held at the esquisite Olympic Club in San Francisco, home of the 2012 U.S. Open. Walsh attended San José State University in San Jose, California, and his first coaching appointment was with Washington High School in Fremont, California. He then served as an assistant coach in college football, first under Marv Levy at the University of California, Berkeley, then with John Ralston at Stanford. He entered the professional coaching ranks with the expansion Cincinnati Bengals in 1968, serving under Paul Brown for seven seasons as one of the architects of the team's offense. When Brown retired as head coach following the 1975 season and appointed Bill "Tiger" Johnson as his successor, Walsh resigned and served as an assistant coach for Tommy Prothro with the San Diego Chargers in 1976. Walsh then moved for the first of two tenures as head football coach at Stanford, from 1977 to 1978. In 1979, Walsh was appointed head coach of the San Francisco 49ers, and under him the 49ers won Super Bowl championships in 1981, 1984 and 1988. Walsh served as 49ers head coach for twelve years and during his tenure he and his coaching staff perfected the style of play known popularly as the West Coast offense. He was responsible for drafting Joe Montana, Ronnie Lott, Charles Haley, and Jerry Rice. Walsh's successes with the 49ers were rewarded when he was elected to the Professional Football Hall of Fame in 1993.